I am excited to feature a talented young artist. We discovered her work on Facebook. When my son Dustin showed me his Facebook friend's post the Pizza Slices Paper Plates Coffee Dress (read below about the ingredients that made up this paper dress), my eyes popped. 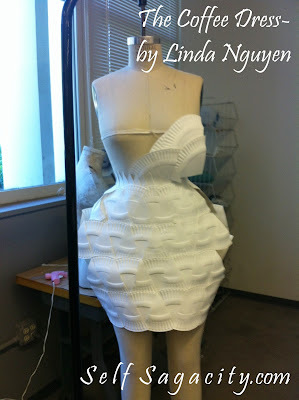 I love how the dress is of abstract design. The textures are mixed perfectly. Soft and subtle, yet, strong and defined. 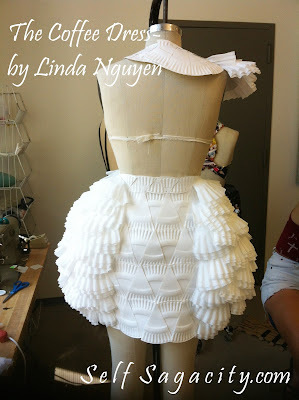 I was motivated to feature the artist's Coffee Dress because of her incredible creativity and style. So naturally I demanded to be introduced to the artist for an interview. 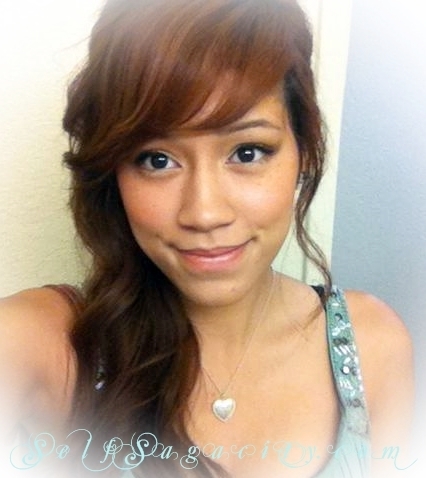 Her name is Linda Nguyen, you can read more about her below. She was also gracious enough to send me some photos of her in progress work. Enjoy! If you like this post please consider Pinterest the photos below. Thanks! 1) Could you tell us a little about yourself? (what are you currently doing? i.e. school, work, project?) My name is Linda Nguyen and I am 21 years old. 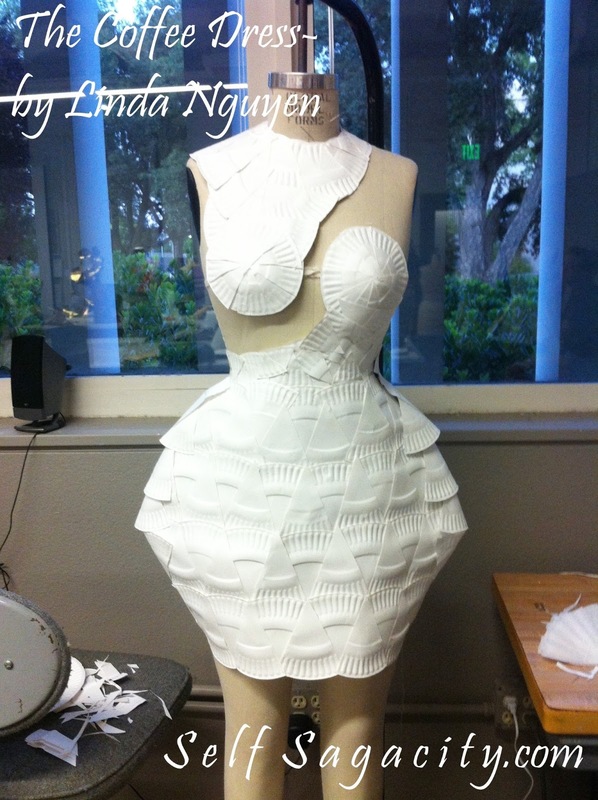 I am currently studying Design with an emphasis in fashion and a minor in economics, at UC Davis. At the moment I am working two different jobs on campus. The first is at the UC Davis Stores, where I assist in designing new heat-pressed clothing apparel for the sales floor and special events. My second job is with the UC Davis Department of Design as a Sewing Lab Technician. 2) What inspired you to create a coffee dress? 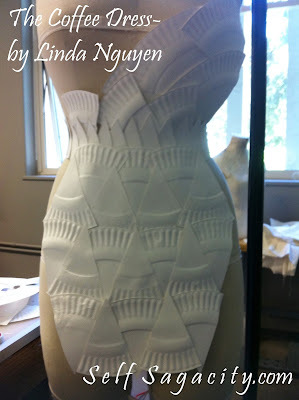 A “Shape to Form” project was actually assigned by my instructor Adele Zhang for my experimental fashion class. The objective of the project was to use only paper products in the cut-out of one single shape to build a garment. We were told to gather miscellaneous paper products from home and I happened to have plenty of paper plates. While cutting the plates into pieces, I discovered that my shape would be what I like to call “the slice of pizza.” After playing with the paper plates I wanted to introduce a different texture, while keeping the color and shape in unison. So I made a visit to the local Dollar Tree where I found coffee filters and I instantly knew that it would be perfect addition to my design. 3) What was the most difficult thing you had to do for the Coffee Dress creation? The Coffee Dress is completely different from anything I have ever worked on. Instead of sewing cut outs of fabrics together, I had to rely on a hot glue gun to individually piece the paper together. The minute you glued a piece on, there was no turning back. You can’t seam- rip and re-sew. There were times when I would glue a piece on incorrectly and had to take off the entire section around it to redo it. The HOT glue also wasn't a lot of fun, especially when it decided to go on your finger rather than the dress … OUCH! 4) Would you change anything on this dress now that you've had the experience? There isn't much I would like to change about the Coffee Dress, I am really satisfied with the outcome and the process of making it was also extremely fun. I am considering doing another garment out of paper, just because you can create almost any shape with it and not worry whether or not it will hold up. I still haven’t put my dress on a live model yet, so I would definitely do that first. 5) What other creative things have you done or like doing? ( I've been taking fashion classes at UC Davis for nearly 2 years now and last winter I made my own signature collection out of hand dyed fabrics. On my free time I absolutely enjoy crafting gifts for my friends and family especially thing like blankets and pillows in the shapes of different cartoon characters. I've made over 20 little Despicable Me minion pillows and a 9 ft tall banner. I also enjoy baking. I wouldn't say I’m the best baker or even close to it, but I really love decorating cakes. 6) What do you aspired to become? (any idols or role models?) My fashion idol would have to be Vera Wang because I am obsessed with bridal wear. One day I would love to become a bridal gown designer. To me there is a lot of sentimental value and meaning behind a wedding gown and I would love to design a gown for every woman’s special day. My role models would have to be my parents. They are my support system and I would not be the person I am today without them.. They've taught me that there is nothing you can’t overcome as long as you work for it. Whenever things are at its worst, I've learn that it can only get better. So live life with optimism, because happiness comes from within! 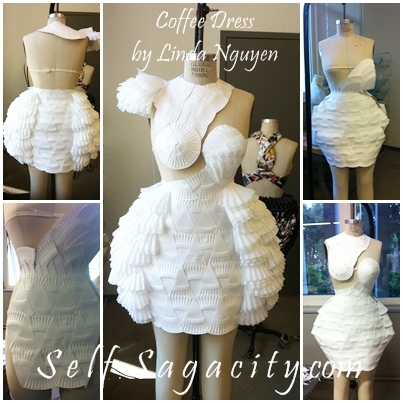 Tell, me would you wear the Coffee Dress if we can recreate the material and shape perfect to your body? Yes. Indeed, that was what I said. I hopped over to read this post from "I should be mopping the floor". I have a friend who has had her work in the New Zealand Wearable Arts, she made a dress out of plastic champagne flutes, it was amazing. I have sent her a link to this post. Thank you Lee, appreciate that you take the time to come see the Coffee Dress. I like the form and the idea. Thanks Colette. I think it is one of my favorite creations. 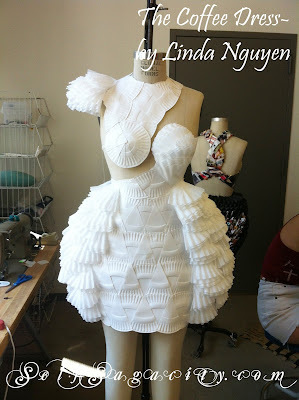 Whoa..she is talented and creative indeed! Wishing her all the luck for the future! Thanks for the comment and visit. It is very creative to me. I love the texture! This is pretty cool! I am responding on behalf of Linda, I will let her know. Thank you so much for your comment and visit. That is amazing! That took so much time and creativity! Definitely take a lot of talent and time! Wow, I would never think of mixing the two textures. But glad Linda did, it looks awesome! Amazing talent! I have several friends in fashion and I am always amazed at how visually talented people look at something and see beauty in it. Who else would have thought to create something beautiful out of something so mundane? I can’t imagine anyone! Definitely one of a kind! There are so many talented people in this world. I think god was generous when he spread the talents around. I definitely would wear it if it doesn't make me look like a pumpkin! That's amazing work! I'm sure she will have a very promising career in fashion someday! I wish her all the luck and all the open doors. She seemed to have her heart in the right place for the fashion business. WOW, that's amazing! Thanks so much for sharing at Amaze Me Monday!